South Asian Americans Leading Together (SAALT), a national South Asian advocacy organization, is deeply disturbed by the deadly shooting of two South Asian men, Alok Madasani and Srinivas Kuchibhotla, in Kansas City that left one victim dead in what appears to be a hate crime. Our thoughts and condolences go to the victims’ families and communities. Sadly, this latest act of violence comes as no surprise given the anti-immigrant, anti-Muslim vitriol escalating across the country, most notably illustrated in President Trump’s divisive recent executive orders. Witnesses reported the shooter yelled “get out of my country” and various racial slurs before opening fire, apparently believing his two victims were ‘Middle Eastern’. SAALT welcomes news that the FBI is investigating whether this incident was racially motivated and we insist that considerations of domestic terrorism are included in the investigation to address the problem of growing white supremacy across the country. The President has yet to comment or offer his condolences to the victims’ families after this latest tragedy, consistent with his pattern of curious silence in the wake of hate violence incidents against many communities including Muslim, Arab, South Asian, and Jewish Americans. When tragedies charged with anti-immigrant sentiment occur on the heels of anti-immigrant executive orders by the President, we must demand better from our leaders. 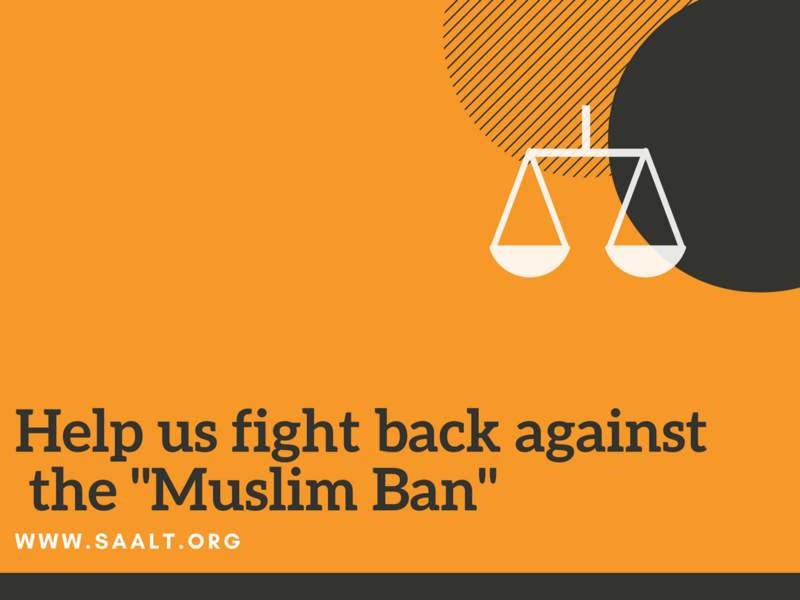 SAALT calls on the President to immediately denounce hate violence and rescind his recent anti-immigrant, anti-Muslim executive orders. We further encourage legislators at all levels to condemn this unacceptable violence. Despite the venomous words of the shooter, there is a place in America for all of our communities, and we will fight fiercely for our rightful place within it. 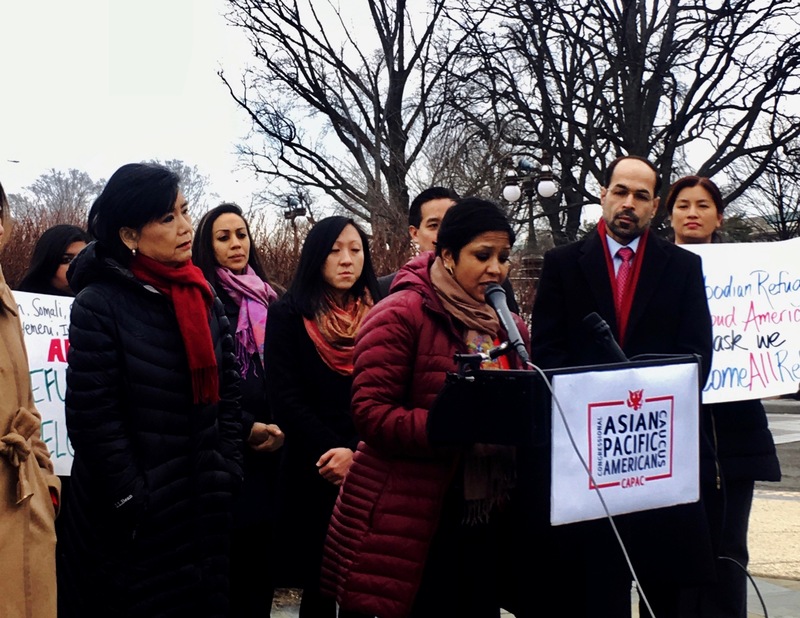 South Asian Americans Leading Together (SAALT), a national South Asian advocacy organization, resolutely objects to the Department of Homeland Security’s (DHS) memoranda implementing President Trump’s executive orders on interior and border enforcement. We believe these memos further relegate South Asian and all immigrant communities to second-class citizenship, questioning our very place in the quintessential nation of immigrants. These policies massively expand and accelerate detentions and deportations, trample upon due process by in many cases removing the requirement for hearings and convictions prior to deportation, deputize local law enforcement to serve as immigration enforcement authorities, and increase the profiling and targeting of immigrant communities already under siege in the wake of recent and controversial executive orders released by this administration. The President’s policies deeply affect the South Asian American community, the most rapidly growing demographic group in the United States at over 4.3 million. The undocumented South Asian population has grown significantly in the US in recent decades. India is the country of origin with the greatest increase in unauthorized immigrants to the United States with a 914% increase since 1990. Currently there are 450,000 undocumented Indian-Americans in the US alone, making India the fourth-highest sending country for undocumented immigrants after Mexico, El Salvador, and Guatemala. As documented in our recent report, “Power, Pain, Potential,” hate violence against our communities has skyrocketed to levels not seen since the backlash immediately after the events of 9/11. At a time when immigrant communities need to feel confident in engaging with local law enforcement to report such incidents, the President’s draconian policies will instead force vulnerable communities to turn inward based upon their fear of profiling and deportation at the hands of the authorities. Overall public safety will likely plunge as a result, as entire communities continue to lose trust in the very law enforcement professionals tasked with keeping them safe. As such, public safety does not increase, but instead cripples under the weight of these short-sighted anti-immigrant policies. Our communities are at the crosshairs. SAALT will continue to fight for the core rights and protections for our communities at the national, state and local levels with our 55 community partners of the National Coalition of South Asian Organizations. We will remain unbowed. 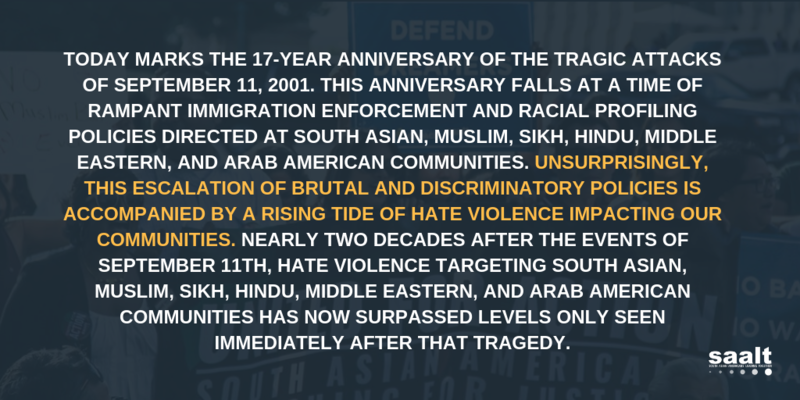 FOR IMMEDIATE RELEASE: South Asian Americans Leading Together (SAALT), a national South Asian American advocacy organization, is proud to endorse the End Racial and Religious Profiling Act 2017 (ERRPA), a critical piece of legislation introduced today by Senator Ben Cardin that provides a comprehensive prohibition on profiling by law enforcement that is woefully missing from existing federal law enforcement policies. If passed, ERRPA creates a uniform definition of racial profiling, including discriminatory profiling based on religion, ethnicity, or other protected categories, prohibited at all levels. ERRPA mandates training on racial profiling issues, authorizes grants to law enforcement agencies to implement best practices discouraging discriminatory profiling, and requires data collection by these agencies. 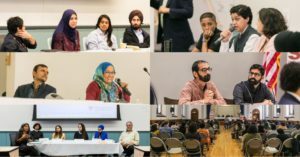 ERRPA comes in light of SAALT’s latest report, “Power, Pain, Potential,” which documents the disturbing increase in profiling, surveillance, and hate violence aimed at Muslim, Arab, and South Asian American communities during the 2016 election cycle, with levels rivaling the backlash in the year after 9/11. Issues of mistrust and accountability from law enforcement have plagued communities of color for decades, and particularly since 2001, when Muslim, Arab, and South Asian communities have been unjustly targeted, profiled, and surveilled by law enforcement. This legislation is now more important than ever, as the Trump administration continues to embolden law enforcement to target and criminalize communities of color through divisive policies such as the Secure Communities program, as well as through destructive executive orders and cabinet appointments. The trust deficit continues to grow between the public and law enforcement at a time when public confidence in policing is urgently needed. The passage of ERRPA can have a civilizing effect in our divided society by transforming our police from a force to a service and ensuring that all are equal under the law. In a month of wrong turns, this legislation is the course correction our country needs to uphold and protect the rights of all. South Asian Americans Leading Together (SAALT), a national South Asian American advocacy organization, vehemently opposes today’s bill introduced by Senator Tom Cotton (R-AR) that aims to crackdown on legal immigration. The bill, named the Reforming American Immigration for Strong Employment (RAISE) Act, would significantly reduce the number of immigrants who can obtain green cards and other visas and would cut the number of legal immigrants allowed in the United States by 40% in the first year and by 50% over a decade. Numbering over 4.3 million, South Asians are the fastest growing demographic group in the United States, with the majority our communities foreign born. Senator Cotton’s bill will make reuniting families a draining if not impossible task for South Asian immigrants who already struggle under a woefully outdated immigration system that makes family reunification a burdensome task. We implore Congress to support and not hinder immigration, to welcome refugees, to not cripple sanctuary cities, and to adopt an accurate and long view of our country’s history that sees immigrants as a fundamental aspect of American life. Last week’s Executive Orders were an affront to the ideals of equality and justice upon which our nation was founded. Building walls, banning Muslims, and crippling sanctuary cities are just a few of the devastating impacts of President Trump’s policies targeting our communities. In response, we’ve seen an inspiring public pushback against these policies nationwide. It’s clear that the new administration feels the resistance. To keep the momentum going, below is a menu of actions you can take to demand justice for our communities across the country. Use the link here to find your Member of Congress. Check here to see which Senators and Governors have taken a public stance against the Executive Orders and find a sample script on the “template for responses” tab of the document. Thank the Members of Congress who have publicly opposed the Orders and demand that those who remain silent or in support speak up in opposition! Earlier this week Senator Feinstein submitted a bill to reverse the ‘Muslim ban’. While it didn’t advance, it will be introduced again and needs more support. Call this number to ask your Senators to pass this bill to reverse the ban: 1-855-976-1858. Attend the National South Asian Summit on April 21-24 in Washington D.C., where SAALT will celebrate the 10-year anniversary of this important gathering of South Asian American organizations, activists, and individuals coming together to claim our power through collective action. To learn more and for information on registration, click here. Read SAALT’s latest report, “Power, Pain, Potential” to learn about the disturbing levels of hate violence and xenophobic political rhetoric targeted at our communities during the 2016 presidential elections. Take a look at these important general resources to find out what you can do to help today. Go through this toolkit prepared by American-Arab Anti-Discrimination Committee to understand the Executive Orders, Jan 27, 2017. Read through this fact sheet on the Executive Orders prepared by the Penn State Law Center for Immigrants’ Rights Clinic and Muslim Advocates, Jan. 27, 2017. Join the numerous direct actions occurring all over the country. Here is a list of airport actions around the country that occurred this weekend or coming up soon. Organize rallies and actions in support of local mosques on February 3, 2017. MPower Change can support your ideas for action. Connect to members of the National Coalition of South Asian Organizations in your state if you want to volunteer or join a rally. If you experience or witness an act of hate violence or xenophobic political rhetoric, help SAALT track these incidents on our online database here. If you’re a lawyer and can donate your time and skills or know someone who needs assistance, consider organizations assisting immigrants and refugees, such as The International Refugee Assistance Project or the American Immigration Lawyers Association. Check out SAALT’s webpage and social media for the latest. These small actions collectively can create large-scale change for our communities and country. SAALT stands ready as a resource and support for all. Contact us at info@saalt.org.